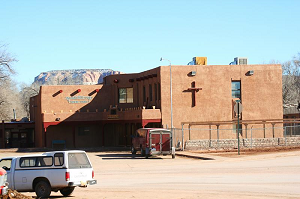 A Catholic School founded by Franciscan missionaries in 1923, located on the Zuni Pueblo Reservation in New Mexico. Currently, the school serves only the Zuni community. The pre-kindergarten through 8th grade school has an annual enrollment of approximately 160 students. The first Indian boarding school was opened in 1879 in Carlisle, Pennsylvania. The main goals of boarding schools were to convert Native American children to Christianity and to “civilize” students to European-American culture by separating them from their families and community. Schools often enforced the wearing of uniforms, punished students if languages other than English were spoken, and even legally changed students’ names. The sexual, physical, and psychological abuse of Native children was common at Indian boarding schools. Native American communities were reluctant to send their children to Indian boarding schools and the U.S. Army and even tribal police sometimes kidnapped children in order to meet enrollment. In 1900, the Bureau of Indian Affairs (BIA) changed some of their policies regarding separating families and many boarding schools became day schools. However, many of these schools continued to promote an educational philosophy that did not include the teaching of Native histories, cultures, or practices. "Zuni Christian Reformed Mission, January 16, 2009" by jewelsofkent. All rights reserved. Fixico, Donald. The American Mosaic: The American Indian Experience. 2016 The Boarding School Experience. N.d. About Us. http://www.stanthonyzuniindianmission.org/, accessed June 24, 2014.